The excitement about the CDF bump is subsiding so we can relax and look back at the LHC. A lot is going on there, although the best of the action will occur later this summer. 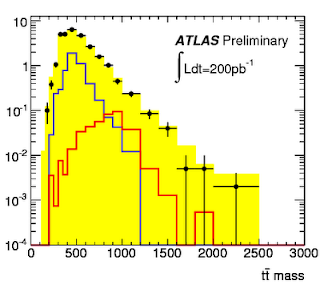 As everyone knows, the luminosity collected by ATLAS and CMS just passed the 1 fb-1 benchmark which had originally been the goal for the entire 2011. The LHC management is running a policy of making careful projections which can later be spectacularly surpassed. We all agree it's better than the previous policy of bold projections and spectacular catastrophes. Unofficial predictions for the luminosity at the end of 2011 are Gaussian distributed with a peak around 5 fb-1. It means that, this year we'll probably learn whether the Standard Model Higgs exists or not! That's massive. Several results using a good chunk of this year's data, around 200 pb-1, have already emerged from ATLAS on the occasion of the PLHC conference in Perugia 2 weeks ago. 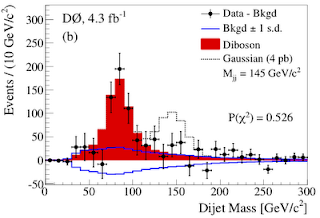 The most interesting result is the t-tbar invariant mass spectrum. The most disappointing, too. If Tevatron's excess in the top quark forward-backward asymmetry is due to a 1-2 TeV heavy Kaluza-Klein gluon the t-tbar spectrum should display a peak or an excess at the tail. Alas, nothing there, as you can see. About the update on searches for Z' decaying to leptons, see Tommaso's blog. There's also a new search for W' in the muon + missing energy channel. In those cases also nothing, only vague rumors. Meanwhile SUSY searches are continuing at full steam. New analyses in the jets+met and jets+lepton+met channels are out. From the plot you can read that, for equal squark and gluino masses, the limit on the masses is above the magic threshold of 1 TeV. If the squarks are decoupled the limit on the gluino mass is slightly less stringent, about 750 GeV, and similalry the other way around. Children take about 6 years to realize Santa Claus does not exist, the LHC may be quicker than that. Theorists, on the other hand, are trying to understand the deeper meaning of the LHC limits on SUSY. The conclusion is that SUSY must be just behind the corner, just a little bit more, one last effort, and we'll see it. One should note that preference of the global fits for light superparticle masses is driven by one measurement: the long standing 3 sigma excess in the muon anomalous magnetic moment. Interestingly, a recent paper reevaluates the theoretical contributions to the muon g-2 and concludes there is no excess whatsoever. I am not in a position to judge whether the paper is correct, drop your comment if you are. 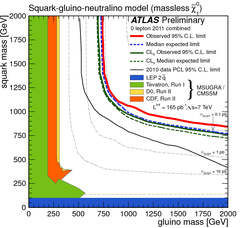 Meanwhile, ATLAS and CMS keep posting papers on arXiv which use only the meager last year's harvest of 35pb-1. At this point it feels like offering ZX Spectrum in an Apple store. The next big dump of LHC results is bound to happen for the EPS conference in Grenoble end of July. Expect numerous new physics analyses using 1.x inverse femtobarn of data. It'll rock! This result has been known to all blog readers since yesterday, now it's officially out. The D0 collaboration just released a new analysis of the dijet invariant mass spectrum in W+2j events using 4.3 fb-1 of data. 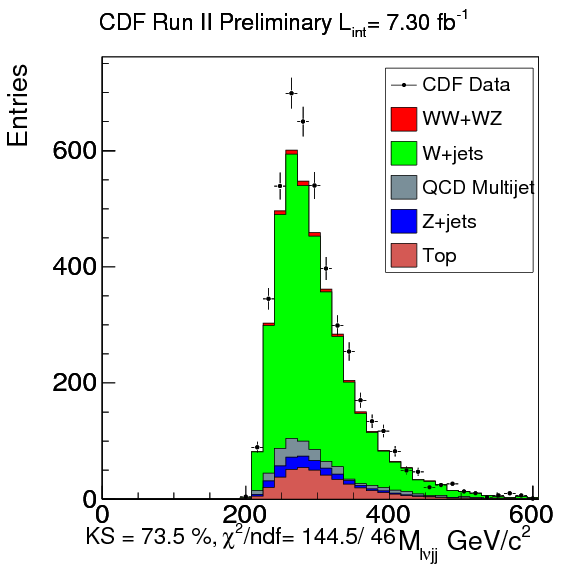 Recall that CDF, looking at the same final state, saw an unexpected bump in the dijet spectrum near 150 GeV which might be a sign of new physics beyond the Standard Model. D0 closely follows the CDF analysis. Their conclusion: no bump. They place the 95% CL limit on the cross section of a hypothetical 145 GeV dijet resonance at the level of 2 picobarns. On the other hand, CDF estimates that fitting their signal requires a larger cross section, of order 4 picobarns, which D0 excludes at 4 sigma. It's not straightforward to draw firm conclusions from these numbers. Although both experiments use almost identical kinematic cuts, they have different detector response, quality cuts, etc., which leads to different results. 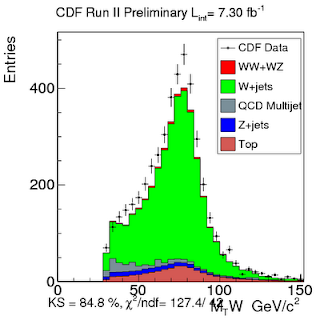 For example, D0 has about 30% more events than CDF near 150 GeV (after scaling with luminosity). It would be illuminating to run realistic models explaining the CDF bump through both detector simulations in order to compare the efficiencies. 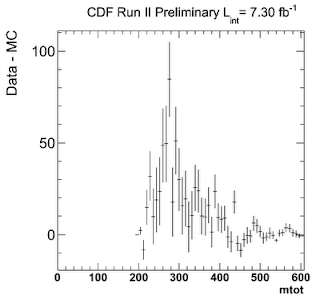 That would allow us to quantify the discrepancy between CDF in D0 (it may well be much smaller than 4 sigma). In any case, not seeing any excess in the D0 data puts a lot of strain on any new physics explanation of the CDF excess. For the moment I don't see any catch in the D0 analysis. Previously, D0 employed differential reweighting to model the W+jets background which might have scaled away any excess; however, the present analysis avoids this step. Also, the D0 data match the Standard Model predictions much better than the CDF ones, also away from the 150 GeV region, which suggests they have backgrounds under better control. 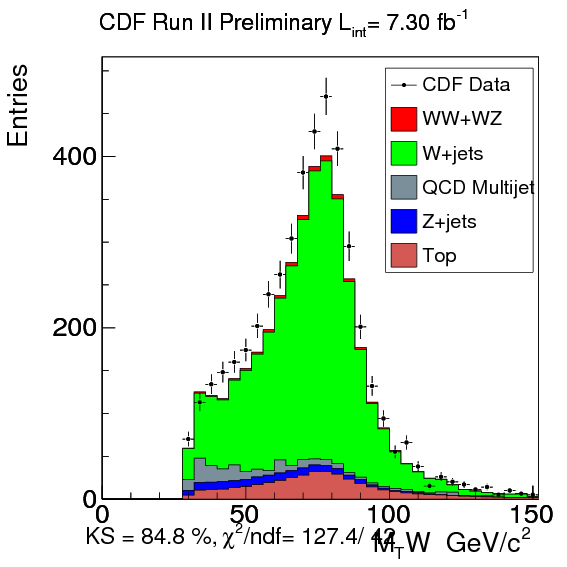 Looking closer at the plots, it seems the main difference between the 2 experiments is their estimate of the QCD multijet contribution (kudos to Jay for that observation), but at this point it is not clear if this can explain the CDF bump. The story is of course all over blogs, see e.g. Tommaso, Michael, Georgios, Peter, Lubos, Sean for more coverage. These days the next round of LHC results is beginning to emerge but for at least another week all eyes will be on the Tevatron. 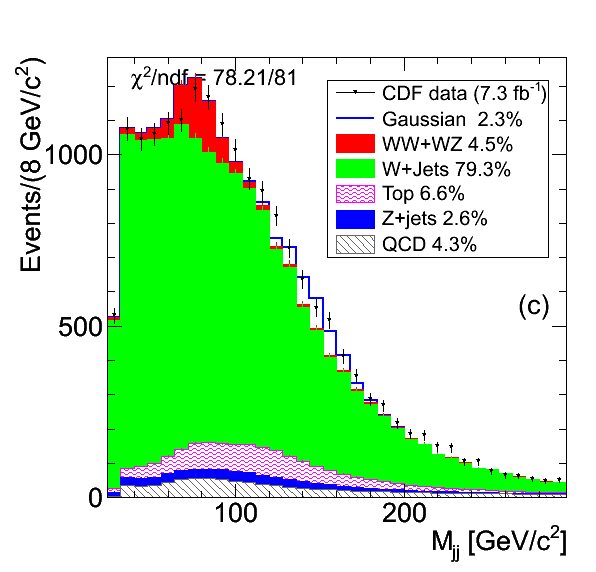 Recall that the CDF collaboration is observing an unexplained bumpy feature in the invariant mass spectrum of jet pairs in events with a W boson. Last Thursday CDF released an online note describing the latest update based on 7.3 fb-1 of data. The significance of the excess has increased to 4.1 sigma. The note describes a number of additional checks that the authors of the analysis have made to exclude background mismodeling as the origin of the bump. In particular, it seems that neither the standard model top quark, nor a difference of jet energy scales between quark and gluon jets can be responsible for the excess. Moreover, the excess persists (albeit a bit smaller) when a different Monte Carlo program is used to simulate the background. All in all, currently none of the known sources can explain the peak in a way consistent with all data. It must be a more subtle detector effect, or new physics. window 115 < M_JJ < 175 GeV where the excess is the largest (thanks guys!). One plot makes you jump in your chair: It shows the invariant mass of the sum of the 4-vectors of the 2 jets, the lepton, and the neutrino, the latter reconstructed from the missing energy. If they all originate from one mother resonance, as suggested by a class of models, the invariant mass should reproduce that resonance mass. Indeed, the plot above shows a clear excess just below 300 GeV. This hints at another heavy particle being produced at the Tevatron, which then decays to a W boson and a 150 GeV particle who is directly responsible for the dijet bump. However, the plot on the right, which shows the same distribution but without subtracting the background, tells you that the standard model also peaks around 300 GeV (as a results of the imposed cuts) which makes the peak less trustworthy. If not for that, we would already be dancing on the streets and indulging in wild orgies. 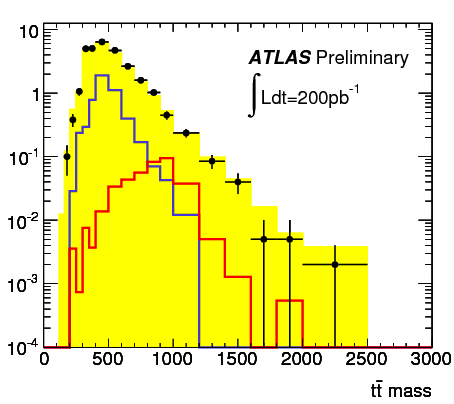 It's also worth looking at another plot showing the transverse mass of the lepton + neutrino system. If the two come from a decay of a W boson, as tacitly assumed in the analysis, that distribution should have an endpoint at m_W = 80 GeV. Since most of the excess is below 80 GeV we can conclude that most of the times the 150 GeV resonance is accompanied by a genuine W boson. This excludes a more exotic class of models I mentioned where the lepton and the neutrino originate from the same particle that is responsible for the bump. What's next? We are of course dying to hear the story from D0 and from the LHC experiments. The update from D0 is imminent. We expect it to be announced on June 10 at the Wine&Cheese seminar in Fermilab (as a general fact, wine facilitates communication between experiment and theory). As for the LHC, a blog post on Quantum Diaries points to an ATLAS note based on 33 pb-1 of data which roughly repeats the CDF analysis and finds no excess. 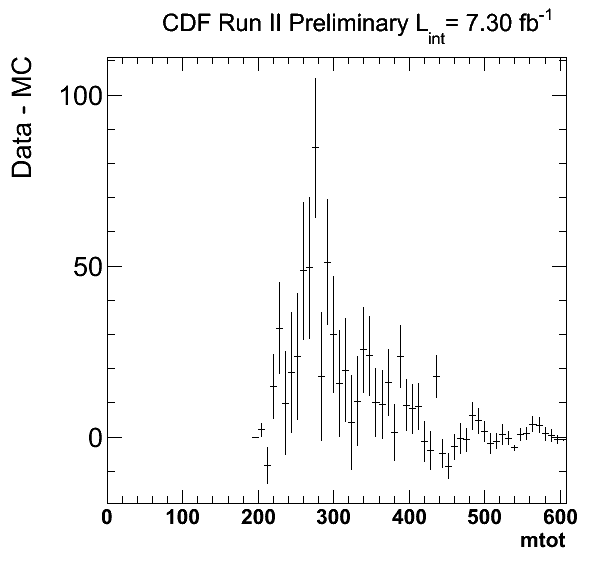 However this means nothing: ATLAS simply had no right to see the hypothetical CDF bump in their 2010 data. First of all, the larger production cross section at the LHC (5 to 40 times, depending on the production mode) combined with the better efficiency does not make up for the 200 times smaller luminosity. Moreover, the W+jets background at the LHC is about 40 times larger. For these reasons you need a larger data set to make any conclusive statement. Suppose the CDF excess indeed originates from a 300 GeV mother resonance. If that resonance is produced by gluon-gluon collisions then the LHC should be able to see the excess already in 200 pb-1, which is the amount of data used in the most recent analyses. I'm sure hundreds of people are looking into this as we speak and as soon as the peak appears it will be pasted into Peter Woit's blog ;-) If, on the other hand, that resonance is produced in quark-antiquark collisions then we need to wait for 1 inverse femtobarn to see a significant excess at the LHC. In any case, the floor should be swept by the end of this summer, one way or another.